We’ve all heard and read them, the folklore, myths, the tips on growing better gardens. How Epsom salts can cure just about anything that is wrong with your plants, moth balls will repel pests, and rusty nails planted with your tender hydrangeas will keep the blossoms blue. Really? Is any of this true? In Coffee for Roses, C.L. Fornari takes on some of the most stubborn gardening myths and folklore in a humorous, gently critical, and yet in the end, very wise way. Her book is really about human nature; our need to believe that simple things can solve complex problems, no matter how wacky the ‘solution’. Fornari writes, “It appears that we’re hardwired to be attracted to the novel: if it’s different, we pay more attention…perhaps this hardwiring explains why we’re more likely to remember odd tips, even if they sound silly…” Seventy gardening myths, from insect repellents, compost, soils, mulch, fertilizers, specific plants, pollinators, and random folklore, are stated and analyzed with real science and gardening facts. Ms. Fornari began researching for this book by reading gardening books from the nineteenth to twentieth centuries. Unfortunately, it is from the mid-twentieth century on that garden advice starts to become questionable. Ms. Fornari states that “Gardeners over 100 years ago were in many ways much more in touch with natural processes and at peace with the necessity of hands-on effort.” Maybe we are inside watching too many garden shows on TV, or online looking for that ‘quick fix' instead of spending the time in our garden observing the natural processes of our growing plants and taking our time to analyze any problems. Maybe we should call on other experienced gardeners in our area to see if any of them have had this particular problem and what worked or didn’t work for them. And then the August/September issue of Organic Gardening arrived with seven more ‘tips’ for the gardener…and the myths keep going round and round. Coffee For Roses is a very enjoyable read; I recommend it as a birthday or holiday gift to every gardener you know (maybe even a gift to yourself.) It is great to see the humor in our gardening habits, not realizing how wacky we may be! Almost every page has a beautiful photograph; who doesn’t like to look at photos of other people’s gardens? 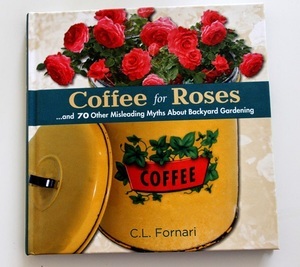 Ms. Fornari is the author of 6 other gardening books, a monthly columnist for Angie’s List Magazine and Prime Time Magazine along with contributing numerous articles to other publications, including American Nurseryman. You may have heard her on a live call-in radio show on WXTK or on NPR stations nationwide. She also blogs and runs a consultation service for Hyannis County Garden, an independent garden center on Cape Cod. Look for her online at www.GardenLady.com and www.CoffeeForRoses.com.